Audrey Turner is fourteen-years-old and a recluse from the outside world. She can’t leave the house, has given up her phone, wears dark sunglasses everywhere she goes, and finds it difficult to tolerate physical contact (or eye contact) with most people. But she never used to be that way. Suffering from Social Anxiety Disorder, General Anxiety Disorder, and depressive episodes as the result of a traumatic bullying experience, Audrey spends her days at home, only interacting with her immediate family- her Daily Mail-obsessed mother Anne, her non-alpha dad Chris, her computer-game-addict brother Frank and her four-year-old brother Felix. Keeping herself within the safety bubble of home and her therapist’s office, Audrey feels that she is actually able to cope with life. This novel deals with anxiety and depression as after-effects of traumatic bullying, so the fact that the story is entertaining and often amusing can be a little disconcerting for some readers, making them wonder whether there is something warped about their sense of humour. 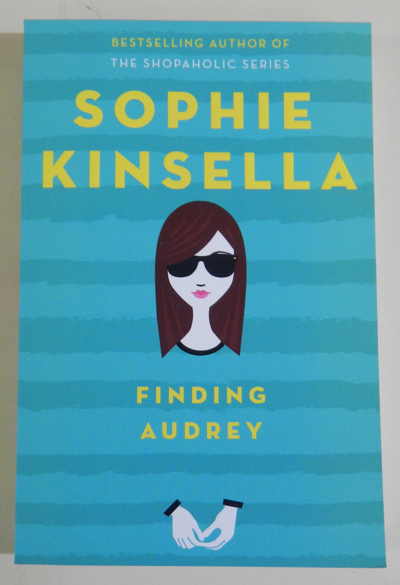 Never fear, however, because that is the talent of Sophie Kinsella. She has been churning out popular comedic fiction for a long time (her books from her Shopaholic series are bestsellers, and the first one was even made into a film a few years ago). She is skilled enough to find the silver lining in most cases and has managed to make Audrey’s condition more relatable to her audience. She has in no way demeaned the seriousness of depression and anxiety, but has instead shown the ups and downs that are associated with the mental illness, while keeping the story light enough for a teenage audience. Kinsella also neglects to tell her readers the exact bullying experience that Audrey dealt with, but her hints about Audrey’s hospitalisation and resulting mental state paint a serious enough picture. Whether this is to discourage similar bullying, or because she wants us to use our imaginations is uncertain, but it means that readers aren’t focussed so much on the details behind why Audrey is the way she is, and instead can focus on the story of her recovery. Despite being the main character of the book (and the narrator), there are actually more interesting people in this novel than Audrey. The real star (in my opinion) is her older brother Frank, who engages in different exploits to outwit their mother. His character perfectly complements Audrey’s, and the family dynamics are easy to relate to. Audrey’s mum, heavily influenced by the doomsayer articles in the Daily Mail, is another stand-out character, and her heated and often confused clashes with Frank provide plenty of welcome and humorous entertainment. The story even reads like a comedy movie script, where you can easily imagine everything playing out on screen. Finding Audrey is an entertaining read, and you will find yourself cheering Audrey and her family on as they try to overcome the obstacles that life throws their way.